In our first Delve Seminar on Scott Fitzgerald’s writing, I was reminded of how group discussion can enrich and benefit the reading experience more so than any individual reading or re-reading. Each person around the table helped as a mirror reflecting a new perspective into the stories we read. Our guide, Lucas Bernhardt, amplified the effect by posing questions to the group and offering context to the stories that revealed new meaning. The first seminar took place on October 15, 2014 and we discussed The Ice Palace and May Day. Lucas began the seminar discussion of May Day by giving our group a little background on Fitzgerald and his rise to literary prominence. We discussed how This Side of Paradise, gave Fitzgerald the reputation of someone able to comment on the new generation. Fitzgerald’s portrayal of a new generation being less than proper gave him a reputation of an author who pushes the envelope. It was immediately clear why Lucas had given us this context because May Day contained themes that undoubtedly furthered Fitzgerald’s reputation. Before the seminar and before the context, I enjoyed May Day as an entertaining story. After the seminar I was able to gain a complete and cohesive interpretation of the story. From the short story it is apparent that the work gets its name because the events all take place during a May Day celebration. However, a member of our seminar brought up the alternate meaning of the term May Day. Although it seems obvious in hindsight, it was something I had not thought of. This realization triggered my outlook on the story. The title, to me, refers to Gordon’s (the main character) distress call and how it was treated throughout the plot events. Many times throughout the story Gordon is depicted appealing for help to the fast moving rich friends of his past. Instead of helping Gordon, he is treated as a pest or a stain on their good time. His calls went unnoticed, or at least nobody acted on him. He was crying May Day in face to face conversations and was ignored. This new understanding of the work, which the seminar helped me develop, allows me to gain a much deeper significance from the story. I intend to approach the stories we were assigned for next week in the same manner and see how the lessons learned in the seminar influenced my ability to draw meaning from them. 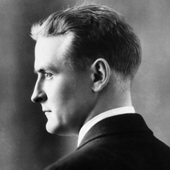 Stay tuned for next week’s Delve Summary on Scott Fitzgerald!